The massacre at a Peshawar school by the Pakistani Taliban has been condemned as un-Islamic – by the Afghan Taliban. We hid in a locker room and pretended to be dead. “The intentional killing of innocent people, children and women is against the basics of Islam and this criteria has to be considered by every Islamic party and government,” spokesman Zabihullah Mujahid said in a statement. The Pakistani Taliban said the attack was in revenge for military operations against the insurgents. Meanwhile the Pakistani government in Islamabad has reinstated the death penalty for terrorist offences which had been suspended. The first funerals have been taking place as Pakistan wakes up to three days of mourning after the slaughter of 132 students and nine members of staff. 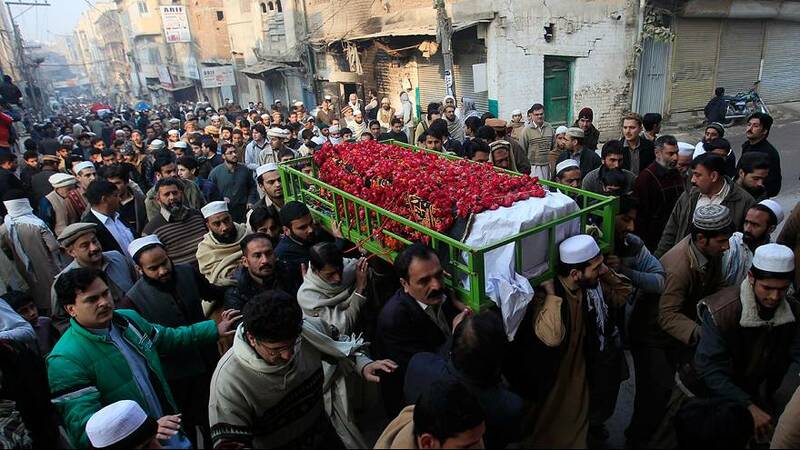 Grade 12 student Abdul Azam Afridi was among those to be buried. Iqbal Afridi, a relative of the victim, said security should have been heightened at the school which was on the Taliban hit list. “We condemn this. These children were the future builders of Pakistan, they were students. What had they to do with any (military) operation or whatever else is happening? They were innocent students. The government should have given them proper security because, as far as I know, this school was getting regular threats. Once or twice it was closed down because of the threats,” Afridi said. Surviving students recovering in hospital have been describing what happened at the army-run school as the gunmen opened fire. “We hid in a locker room and pretended to be dead. The militants kind of believed us, but two of our group, including a female teacher, caught their attention so they shot them in the head to make sure they were dead. After they shot the teacher, they burnt her body,” said student Mehran Khan from his hospital bed. The Afghan Taliban has surprised some by condemning the attack. Some experts say the group behind the attack, the Pakistani Taliban, has evolved into a separate organisation with its own goals. In Pakistan’s largest city Karachi at the other end of the country, candlelit vigils were held to mourn the victims. The deliberate slaughter of so many children has stunned a nation already weary of extremist attacks. Peshawar sits on the edge of a lawless tribal belt straddling the Afghan border. Both the Afghan and Pakistani Taliban are bent on toppling their respective countries’ governments and imposing their strict interpretation of Islamic law. The Pakistan military has responded to the school massacre with massive airstrikes on Taliban targets in the border region.